Inspectors from the department of buildings are on the lookout for improper and illegal use of knuckle boom trucks. These trucks are popular at job sites because they can respond quickly and have a boom that can lift up to 100 feet. Pei-Sze Cheng reports. 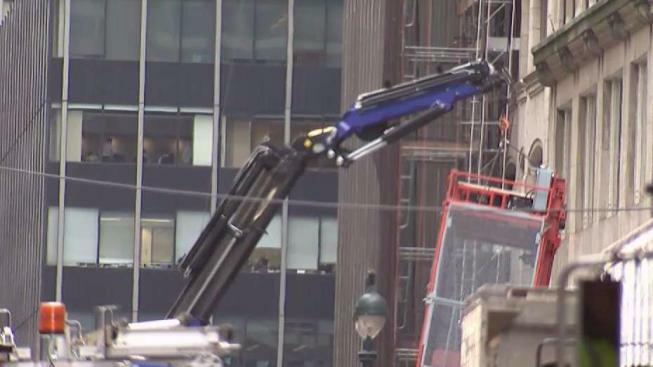 Most New Yorkers are familiar with boom trucks, with hundreds of the mechanical construction arms at construction sites throughout the city. But what they may not know is that those trucks are not supposed replacements for heavy construction cranes -- and when they are used that way, city officials say it can have disastrous results. That’s why inspectors from the city Department of Buildings have been on the lookout for improper and illegal use of knuckle boom trucks. These trucks are popular at job sites because they can respond quickly and have a boom that can lift up to 100 feet. But per city regulations, knuckle booms are only supposed to be used to load or unload a truck or a trailer. Anything more than that -- including construction or lifting of heavy equipment or construction vehicles -- requires a licensed crane operator and various certificates of approval and operation. In January, a boom truck was placing a beam on top of a building in Queens when it flipped over, collapsed and the boom nearly struck a gas station. Last month, a boom truck was lifting supplies onto a roof in Brooklyn when it dropped its load and crushed a sidewalk shed and awning below. “We are trying to avoid this, that could have been a lot worse. There could have been loss of life,” said Department of Buildings inspector Michael Linton. Linton and other inspectors ride around the city looking for this type of activity. At a job site on Washington Avenue in Brooklyn, an inspector shot video and cited the company for illegally operating the boom truck as a crane. A supervisor on the job told the I-team that they have corrected the violations and hired a crane company. What’s more, officials believe there are about 1,000 knuckle boom trucks around the city, but they don’t know for sure. “They don't need to register and it's very hard for us to find these and figure out which job sites they are working,” admitted Linton. Pinchas Leitner is the owner of Lifting Solutions in Red Hook, Brooklyn. He has owned a boom truck business for 14 years and has been cited by the city for violations including “unlicensed work,” a violation he disputes because the city does not require a license to operate a knuckle boom. Still, the city’s enforcement is having an effect on his business. “We are using it for deliveries we are cutting down a lot on the types of work we have been doing, we have lost a lot of business,” explained Leitner. In the meantime, the crane industry is scrambling to get ahead of a growing problem. Two years ago, Local 14-14B International Union of Operating Engineers, the union for crane truck operators, started offering boom truck classes due to its popularity. Thomas Gordon, a training director, says two years ago, they started offering boom truck classes due to its popularity.